From August 13-17, 2012, something special happened in Montana. 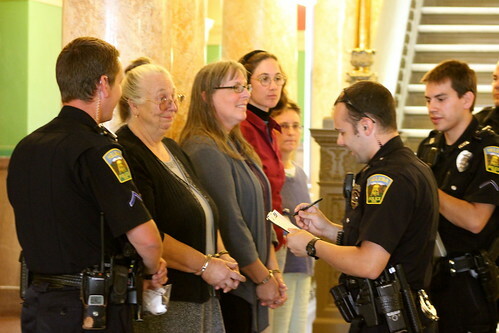 People of all ages and from many different backgrounds came together and took the fight against coal exports to a new level, by staging a peaceful, week long sit-in in the State Capitol rotunda. This nonviolent action was designed to protest the Montana State Land Board’s decision to lease state lands to the coal industry, and it drew local, statewide, and national media coverage to this issue. Twenty-three people were arrested during the course of the 2012 Coal Export Action, making it the largest climate-related civil disobedience to date that Montana has ever seen. Hundreds more participated in marches and rallies in support of those risking arrest. The organizations involved included Blue Skies, Montana Women For, Bozeman Climate Alliance, local Occupy groups, 350.org, and many others. During the week of the action, a new kind of climate movement was born in Montana – one focused on the moral urgency of stopping massive fossil fuel projects, even if it means putting our bodies on the line. On September 15th, 2013, Blue Skies and our partner groups once again took the movement against coal exports to a new level. Fourteen people walked onto a railroad right-of-way in Helena, and held a sit-in between the two main tracks used to transport coal through Western Montana. Because the railroad was unwilling to move trains through the area while a protest was going on, this action effectively shut down the main rail line used to transport coal to the West Coast. The Showdown Against Coal Exports once again drew statewide media attention to the urgency of our fight, and sent the message to decision makers that Montanans are willing to literally stand in the way of coal reaching the West Coast, if that’s what it takes to stop coal export projects. Coal trains endanger our health, safety, and environment in communities up and down Montana’s rail lines, and now these communities are rising up to stop this threat. Read more about the September Showdown Against Coal Exports. 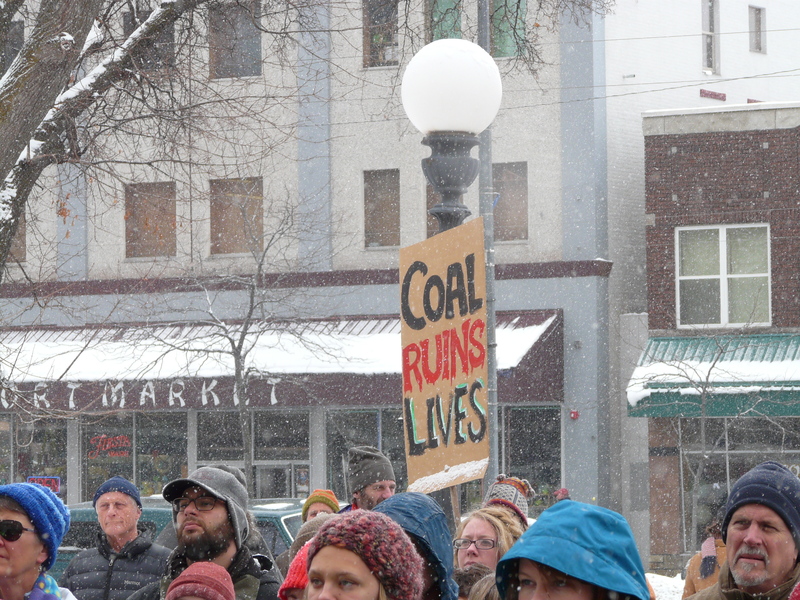 On February 22nd, 2014, more than 200 Montanans rallied in Missoula in sub-freezing temperatures, to send a message to decision makers that we won’t sit back and let our community become a major coal export zone. Stop the Coal Train Strain was the largest rally specifically focused on opposing coal exports in Western Montana so far, and brought together people from all walks of life including students, elders, working people, educators, and indigenous organizers. During the event, we heard from speakers including former Missoula City Councilor Dave Strohmaier, Indian People’s Action organizer Naomi Odermann, and local poet and social justice advocate Rita Jankowska-Bradley. If new coal export projects go through, rail towns like Missoula will see an increase in dirty coal train traffic that pollutes our communities and endangers public health. At Stop the Coal Train Strain, we showed that rail line communities are ready to put up a fight to stop coal exports, and we’re determined to make sure our voices are heard. See some of the media coverage from Stop the Coal Train Strain.